Late bloomers | Pursuing "enough"
I thought about titling this post “Winter is coming,” but figured that might be mistaken for other topics…. Back in the spring my older daughter and I planted morning glories and moon flowers on the south side of the deck, as we do every year. The vines grow up and over the railing until we can see them from the living room and kitchen. Planting both gives us flowers literally all day and night; in the morning and evening we get an added show as they all are still open, together. This year we (ahem….I) made the mistake of not thinning the flowers. It was spring, and seedlings were popping up all over, and the whole scene was just so full of hope….I couldn’t quite bring myself to snuff out the future of a handful of plants. This year we grew huge, enormous, giant vines. Thick, winding, tangled vines. Vines with leaves over three inches across. They were massive. I finally started going out once a week with a pair of scissors to chop out the vines I couldn’t guide along the spindles and railing. They absolutely took over. Eventually, late in the summer, some moon flowers appeared; then more and more. I was grateful we’d gotten at least a flurry of blooms to enjoy and wrote off the rest. 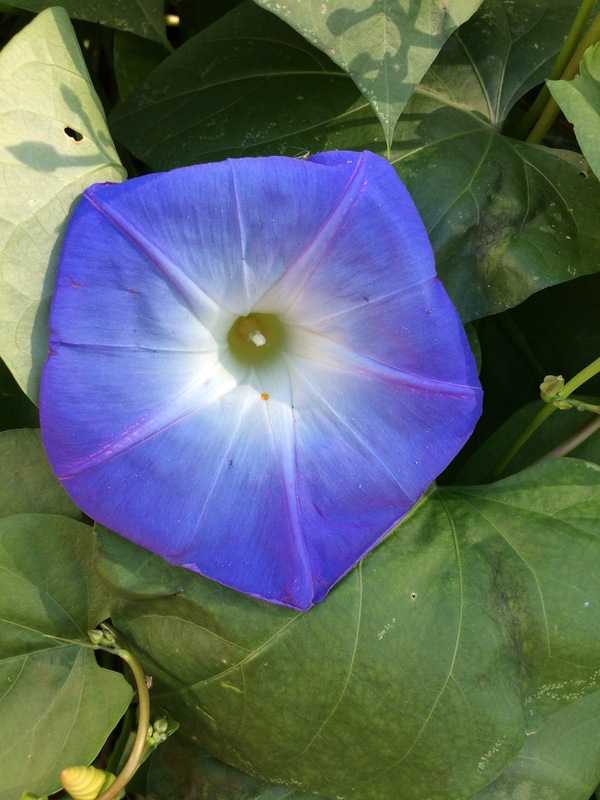 Until mid-October, when the morning glories exploded. Dozens upon dozens of buds–hundreds, even?– appearing all over the east section of vine. They were everywhere, and finally starting to open. Sure enough, before these ever got a chance to bloom to their fullest, we had our first hard freeze. They hung in through one night surprisingly well, but night two, well…..it’s definitely time to put the garden to bed for the winter. We always hear about the late bloomers, the ugly-duckling stories of the awkward and unlovely who finally show up in their lives fully and beautifully. But what happens if you forget to show up in your life until it’s too late? Is there such a thing as too-late of a bloomer? What would you regret not doing if you knew “winter” was tomorrow? First of all, I love this. Thank you for writing it! To answer your question? Finishing my memoir. Not because it is a burning need of mine to get it finished, but because I’ve just spend so frickn’ much time on it. Wouldn’t it be nice to have a legacy that was finished? Need to put the edit back in my daily queue. “Wouldn’t it be nice to have a legacy that was finished?” I love THAT. Good luck with your editing!! Pingback: Do the hard thing | Pursuing "enough"
Pingback: Hello, Fall | Pursuing "enough"